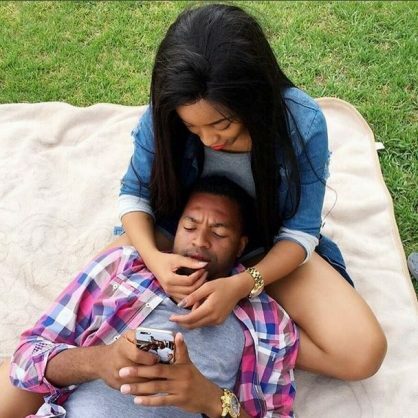 Itumeleng Khune and his girlfriend, Sbahle Mpisane. Kaizer Chiefs goalkeeper and his girlfriend Sbahle Mpisane have started sharing picture of each other on social media after getting back together a few months ago. Khune and Mpisane kept their relationship a secret for a while after getting back together, Mpisane had previously announced that they broke up without sharing details of the break up. “Love is that condition in which the happiness of another is essential to your own,” read a caption on a video Khune posted of himself and his girlfriend. His followers asked him to marry his girlfriend and Khune answered. Anginamona ngithi akamushade this thing of dating someone take pics put them on social media nihlukane delete the pics thola omunye wenze the same thing ayikhombisi ukukhula.